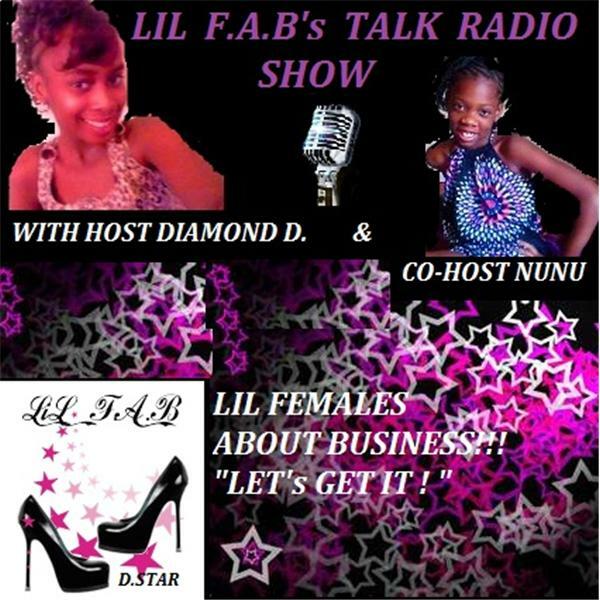 LiL Fab Show stands for LiL Females About Business. Which is associated with the original FAB Team (Females About Business. Created by D.star)The LiL Fab Show place where young girls (11&up) can come together to talk about todays trending topics, vent, discuss life issues, motivate each other & have fun! DO YOU THINK MUSIC INFLUENCE KIDS IN THE WRONG WAY? IS SOCIAL NETWORKS APPROPRIATE FOR KIDS OR TEENS? DOES REALITY T.V HAVE A BAD INFLUENCE ON YOUNG TEENS? DO YOU HAVE A ROLE MODEL? WHO DO YOU LOOK UP TOO & WHY? Todays Trends. What's HOT and what's NOT! JEALOUSY, IS THERE A SUCH THING AS A GOOD / BAD JEALOUSY? Racism, do you think it would ever end ?